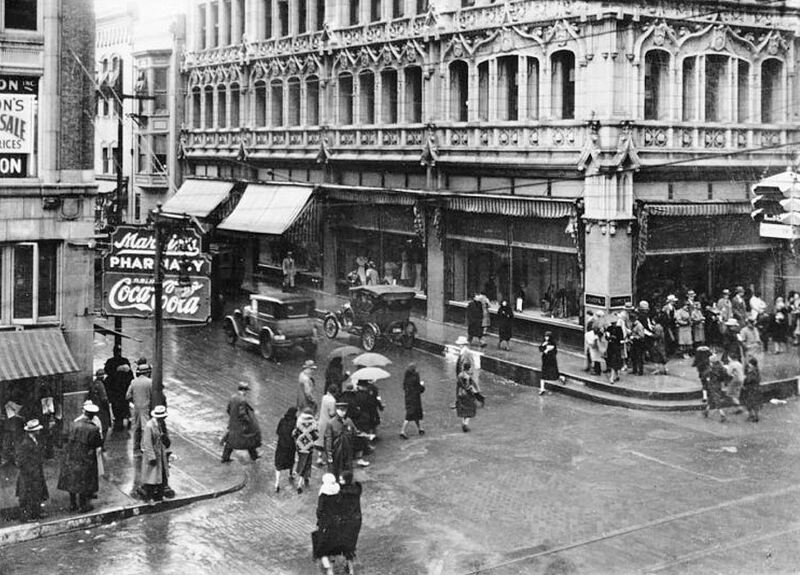 A nice photo of a rainy day downtown, almost 85 years ago. The photo — taken on January 16, 1932 by Dallas photographer Frank Rogers — shows the intersection of Main and Akard (the people with umbrellas are crossing Akard Street, heading east). Marvin’s Drug Store (which occupied the ground floor of what was later known as the Gulf States Building) was on the northwest corner, and the A. Harris department store occupied the first five floors of the Kirby Building (originally the Busch Building) on the northeast corner — both buildings are still standing. A similar view of this intersection today, via Bing, can be seen here. Photo from the Fall, 2013 issue of Legacies, viewable at the Portal to Texas History, here. And one Model T Ford with its side curtains erected.